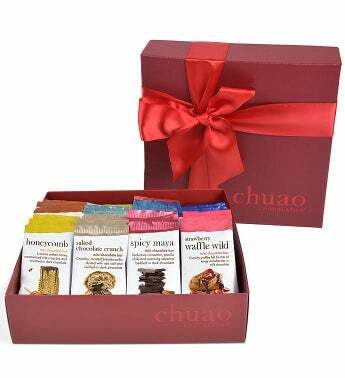 This 36 bar gift set is beautifully boxed in a premium quality Chuao signature gift box and tied with a red fabric ribbon. All bars have been produced using Non-GMO ingredients and crafted with Fair Trade Certified cacao. They free of artificial preservatives, sweeteners, colors, flavors and hydrogenated fats. Potato Chip mini bar: Crisp kettle cooked potato chips and a hint of sea salt, mix and mingle in milk chocolate. Caramel Apple Crush mini bar: Tangy green apple flirts with buttery caramel in milk chocolate. Salted Chocolate Crunch mini bar: Crunchy, toasted breadcrumbs dusted with sea salt and swirled in dark chocolate. Totally Tangy Mango mini bar: Sweet mango sprinkled with tart lime, sea salt and a pinch of chile in rich dark chocolate. Cheeky Cheeky Churro mini bar: Crunchy, sweet cinnamon & sugar churro swirled in dark chocolate. Pop Corn Pop mini bar: Mixed puffed whole grains, toasted corn chips, and a sprinkle of sea salt with a surprising POP in milk chocolate. Orange-A-Go-Go mini bar: Rich dark chocolate grooves with zesty bits of candied orange and soulful orange bergamot. Sweet & Salty mini bar: A sprinkle of sea salt, swirled into creamy milk chocolate. Strawberry Waffle Wild mini bar: Crunchy waffles fall for bits of tangy strawberry in milk chocolate. This gift box of 36 mini premium chocolate bars is perfect to share with friends, co-workers, family, OR to keep in your secret chocolate stash! Chef Michael has created a gourmet chocolate experience with unique all American flavor combinations. Favorites include Baconluxious, Potato Chip, Caramel Apple Crush, Cheeky Churro, and Strawberry Waffle.